The O'Neill store at Anaheim GardenWalk is having a storewide sale tomorrow to benefit the Twin Towers Orphan Fund. 40 - 70% clothing, footwear and accessories, 20% off surfboards, wetsuits, sunglasses and skateboards. Sat 9/11: LA Derby Dolls at 6 pm (women who kick a**) + food trucks too! The L.A. Derby Dolls are Southern California's premiere all-female, banked track roller derby league. Founded in October 2003 by Rebecca Ninburg (a.k.a.Demolicious) and Wendy Templeton (a.k.a. Thora Zeen), the L.A. Derby Dolls are a league of more than 150 skaters and volunteers, divided into five teams who skate on a banked track. Embodying the do-it-yourself ethos of modern roller derby, as resurrected in Austin, Texas in 2000, the L.A. Derby Dolls are an entirely volunteer-run organization, relying on the support of their fans and community. The L.A. Derby Dolls take all the thrills of the old game and update it with a fresh and feisty new face. And the hits and spills are 100% real. No script can write this kind of action. For more information go to http://derbydolls.com/la/ http://tinyurl.com/258jtkh Pls RT! EPL's 30th Anniversary means a new online coupon for YOU every day in September! Get your coupons here: www.elpolloloco.com/30thanniversary http://tinyurl.com/258jtkh Pls RT! Due to unforeseen circumstances, MUNCH LA regretfully has to cancel its event on Saturday, September 18th, 2010. MUNCH LA deeply apologizes to our supporters for any inconveniences and we hope to reschedule our event soon. In the meantime, full refunds on tickets will be available. Please let us know if you have any questions and we will keep you posted. Sept 13: Cheer your Anaheim Ducks in a sushi rolling contest! 3 course menu is back at TGI Fridays! Three cheers! One for each course! Yes, the 3 Course Menu is back at TGI Friday's and it's just $12.99. Check it out! PUMPKIN MAGIC is here! Stop by participating Tully's for a Pumpkin Spice Latte or a Pumpkin Spice Tea Latte! Any size for $2.99! Endless Shrimp at Red Lobster is Back! OCFrugalFinder is getting a real domain! Great news! In a few days you won't have to memorize this long blog address. Shortly, you'll just key in a new url: http://www.ocfrugalfinder.com/. I'm still working out the kinks, so meanwhile bookmark this site, and eventually you'll be redirected to my new site. Thank you to my followers, and please tweet me ideas at www.twitter.com/ocfrugalfinder (@ocfrugalfinder). Having fun and eating doesn't have to cost a lot of money, and I'm here to spread the frugal findings! 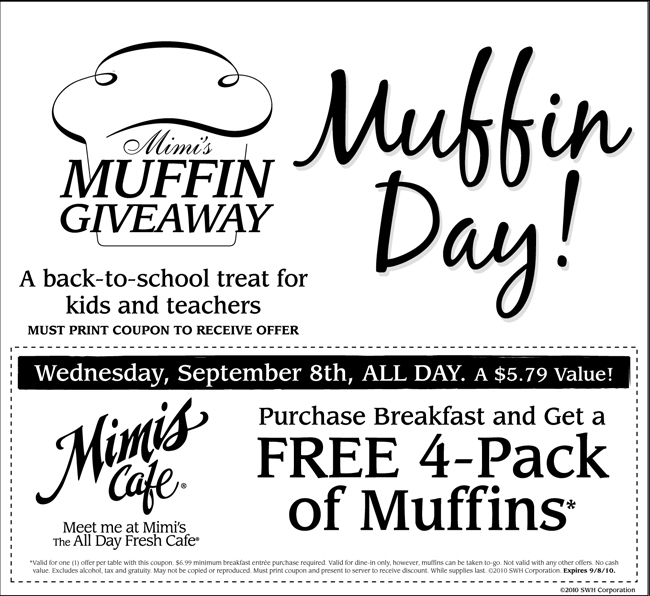 Sept 8: Free 4-pack muffins at Mimi's Cafe - all day! Click here for printer friendly coupon http://tinyurl.com/258jtkh Pls RT! Buy one, get one free from Rubios.,..